Sunday 14th April 2019 will be remembered for a long time by our young reds, born in 2011 & 2012. 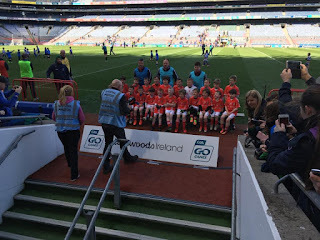 The players within these age groups have been selected to take part in the Croke Park Experience and will get an opportunity to play on the hallowed ground at 12 noon that Sunday. On the day our 3 teams will play Ratoath of Co. Meath, on the Hogan Stand side of the field. We expect that somewhere between 45 & 50 players will travel with us on the day. A rough itinerary is set out below. The club will be arranging buses to travel to Croke Park for players and parents. However, there is parking if you wish to drive. The club will arrange for a new club hoodie/top for each player for the occasion and provide lunch on their route home. This will be a very special day and we want to make it one to remember. A requirement from all clubs in attendance at days of this nature is that each club must have a completed consent form. This includes a signature from a parent/guardian for all children in attendance – including permission to take photos and possibly video footage. It is a requirement that all clubs bring this form completed and have it available for presentation on the day if required. We will provide the forms at training/games this weekend and on the day if required. If you have any questions or queries, please contact Colm on 087 7638171. There are some key details below for travelling parents & supporters. Croke Park will be open on the day and admission is free. This car park will be limited to Buses Only as there is limited space available. Access to the Stadium from the Davin Stand Car Park will be through the Cusack Stand. Access to the Davin Stand Car Park is off North Circular Road down St. Margarets Ave.
Games 9-a-side with substitutions at half time only. In many cases the entire team might be substituted to make way for 9 new players for the second half. As highlighted to all counties in advance, the maximum number that can be catered for in a single slot / single pitch is 18. For clubs with 19-36 players, we are working on the basis you have been allocated two slots and for clubs with numbers greater than 36, a three slot allocation is needed.